Thua Thien-Hue (VNA) – The central province of Thua Thien-Hue is striving to raise its forest coverage to 57 percent in 2020 from the current ratio of 56.3 percent. The province, which is one of the localities leading the country in terms of forest coverage, has more than 502,000 hectares of natural land, including 283,000 hectares of forests. In order to strengthen measures to manage forests and forest land, along with the setting up of funds for forest protection and management at the communal level, the province has provided funding for the protection of more than 150,000 hectares of forest land. 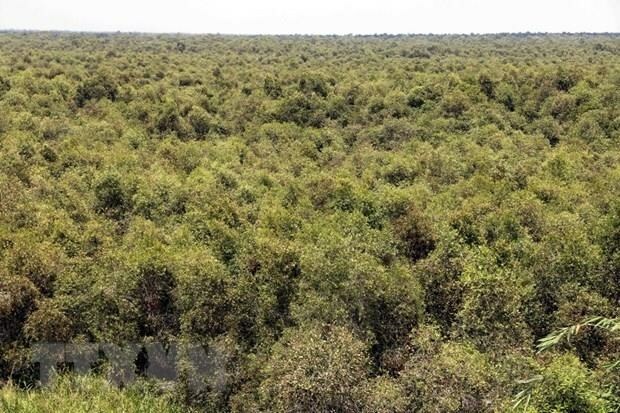 Thua Thien-Hue has collected more than 30.5 billion VND of environmental service fees from forest owners to pay for agencies, organizations and households engaging in the protection of about 129,032 hectares of forest land. The province has granted the Forest Stewardship Council (FSC) certificates to households involving in 1,307.7 hectares of forest. The provincial Department of Agriculture and Rural Development has built a plan to implement the target programme on sustainable forestry management with an aim to develop forestry in a sustainable manner in line with urban development plan to create green space and green city. The province will protect biodiversity of special-use forest to maintain rare flora and fauna genes for scientific research and ecotourism. Forestry occupations will be expanded to reduce poverty for people living in mountainous and buffer zones. Along with strengthening State management over forest and forest land management, the province will increase communications and law education among locals, especially communities living near the forest, on the need to protect the forest. Ho Si Nguyen, Director of the provincial Department of Agriculture and Rural Development, said that the sector will give forest land and forests to organizations, communities and households for a long-term for management, while calling for the engagement of different economic sectors in forestry production, and fostering cooperation with international organizations in the field. In 2018, Thua Thien-Hue planted 1,000 hectares of new forest areas, including 460 hectares of protection areas, 140 hectares of special-use forest, and 400 hectares of production forest areas.